Trading on the junior market was dominated by Eppley with a 15 percent jump in the price, resulting in a gain of $75.76 to close at $580.76 for a new 52 weeks’ high with 100 shares changing hands. The rise in Eppley and recovery of $1.05 in the price of Lasco Manufacturing resulted in the junior market index rising a sharp 94.48 points, to end at 2,159.33. At the close, there were two 52 weeks’ highs with 14 active securities trading, with 8 advancing and 3 declining. Volume traded is just 534,047 shares valued at $3,394,975, while 4 stocks closed with bids higher than the last selling prices and 3 ended with lower offers. 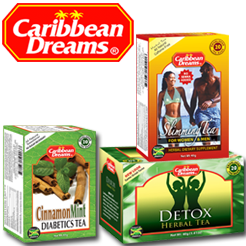 At the end of trading in a market, Caribbean Cream traded 19,811 units and fell 15 cents to end at $4.20, Caribbean Flavours had 104,812 shares changing hands at $8.50, Consolidated Bakeries gained 10 cents in trading 40,000 shares to close at $1.35, Dolphin Cove had 16,144 shares changing hands at $12.50. Honey Bun rose 75 cents to end at a 52 weeks’ high of $17.95 with 500 shares trading. Iron Rock Insurance traded at $3.40 at the close while 4,000 shares changed hands, with a gain of 5 cents, Jamaican Teas traded 1,817 shares and gained 1 cent to end at $4, Jetcon Corporation ended at $2.90 while 66,153 units traded. Key Insurance traded 5,300 shares but gained 30 cents to end at $2.80, Lasco Distributors fell 10 cents and ended at $7.50 with 213,679 shares trading, Lasco Financial gained 25 cents to close at $3.40 with 25,585 shares changing hands. Lasco Manufacturing rose $1.05 to close at $4.60 with 27,458 shares trading and tTech ended with 8,688 units changing hands to end with a loss of 30 cents at $4.15. 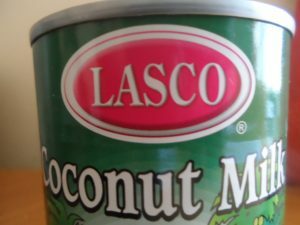 The Lasco companies traded the most shares on Friday. Trading on the junior market saw more stocks rising than declining, but a fall of $1.30 in the price of Lasco Manufacturing resulted in the junior market index falling by 38.55 points to end at 2,064.85 as the three Lasco listed companies accounted for the bulk of the volume for the day. . There were 12 active securities trading, with 8 advancing and 3 declining. 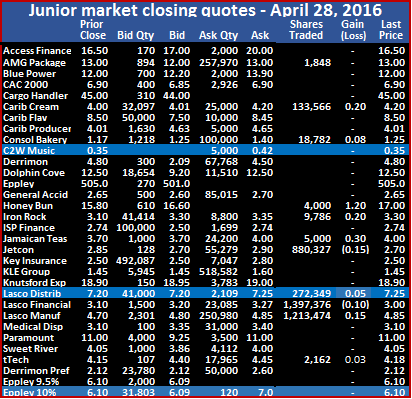 At the close, 9 stocks closed with bids higher than the last selling prices and 3 ended with lower offers. Volume traded is 2,216,522 shares valued at $11,878,080. At the end of trading in a market, AMG Packaging traded 16,841 shares at $13, Caribbean Cream traded 68,200 units to gain 15 cents and end at $4.35, Honey Bun rose 20 cents to end at $17.20 with 305 shares trading. Iron Rock Insurance traded at $3.35 at the close while 8,800 shares changed hands, with a gain of 5 cents, Jamaican Teas traded 25,571 shares and fell 1 cent to end at $3.99, Jetcon Corporation gained 20 cents to end at $2.90 while only 500 units traded. Knutsford Express traded 9,600 shares but fell $2.10 to $16.80, Lasco Distributors rose 35 cents and ended at $7.60 with 998,711 shares trading, Lasco Financial gained 15 cents to close at $3.15 with 569,195 shares changing hands. Lasco Manufacturing fell $1.30 to close at $3.55 with 488,299 shares trading, Medical Disposables rose by 10 cents in trading 30,000 shares to close at $3.20 and tTech ended with 500 units changing hands to end with a gain of 27 cents at $4.45. 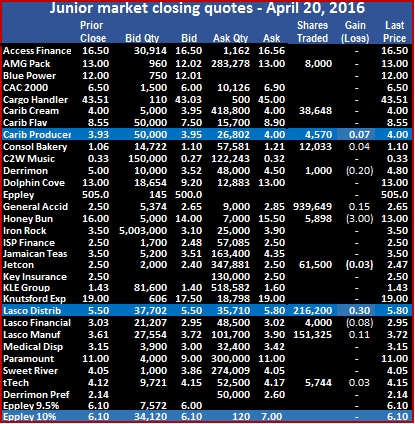 Lasco Financial traded the largest volume of 1,397,376 units on Thursday. Trading on the junior market was more sedate than on Wednesday, with just over half the numbers of securities trading compared to 20 yesterday. 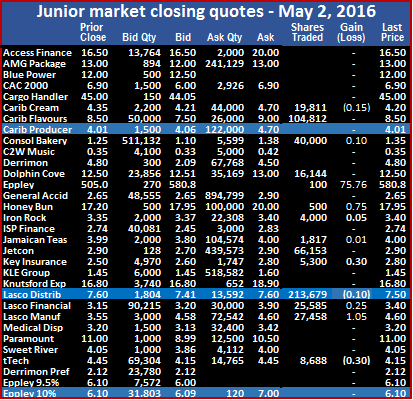 At the close, the junior market index eased just 6.50 points to end at 2,103.40. There were 11 active securities trading, with 8 advancing and 2 declining. .
At the close, 7 stocks closed with bids higher than the last selling prices and 3 ended with lower offers. Volume traded is 3,938,670 shares valued at $14,970,710. At the end of trading in a market, AMG Packaging traded 1,848 shares at $13, Caribbean Cream traded 133,566 units to gain 20 cents and end at $4.20, Consolidated Bakeries rose 8 cents in trading 18,782 shares to close at $1.25, Honey Bun rose $1.20 to end at $17 with 4,000 shares trading. Iron Rock Insurance traded at $3.30 while 9,786 shares changed hands with a gain of 20 cents, ISP Finance had 50,000 shares changing hands and rose 29 cents to close at $2.74, Jamaican Teas traded 5,000 shares and gained 30 cents to end at $4, Jetcon Corporation fell 15 cents to end at $2.70 while 880, 327 units traded. Lasco Distributors rose 5 cents and ended at $7.25 with 272,349 shares trading. Lasco Financial lost 10 cents to close at $3 with 1,397,376 shares changing hands, Lasco Manufacturing rose 15 cents to close at $4.85 with 1,213,474 shares trading and tTech ended with 2,162 units changing hands to end with a gain of 3 cents at $4.18. 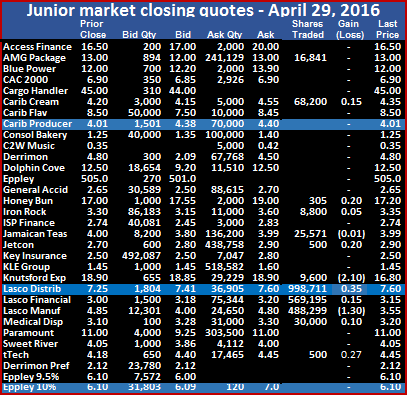 Lasco Financial traded the most shares on the junior market on Wednesday. Trading on the junior market resulted in more stocks rising exceeding declining ones by a wide margin and ended with the index rising 42.37 points to end at 2,109.90 on Wednesday. 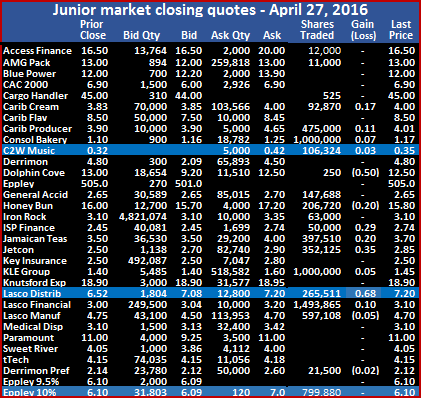 There were 20 active securities in the junior market with 10 advancing and 4 declining. .
At the close, 2 stocks closed with bids higher than the last selling prices and 2 ended with lower offers. Volume traded is 7,092,876 shares valued at $25,938,952. At the end of trading in a market, Access Financial Services closed at $16.50 with 12,000 units changing hands, AMG Packaging traded 11,000 shares at $13, Cargo Handlers closed at $45, with 525 shares changing hands, Caribbean Cream traded 92,870 units, but recovered the 17 cents it lost on Tuesday to end at $4. 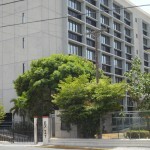 Caribbean Producers gained 11 cents to end at $4.01 while trading 475,000 units. Consolidated Bakeries rose 7 cents in trading 1,000,000 shares to close at $1.17. C2W Music gained 3 cents while trading 106,324 units to end at 35 cents, Dolphin Cove traded 250 shares with a loss of 50 cents at $12.50, General Accidents closed at $2.65 with 147,688 shares changing hands, Honey Bun lost 20 cents to end at $15.80 with 206,720 shares trading. Iron Rock Insurance traded at $3.10 while 63,000 shares change hands, ISP Finance had 50,000 shares changing hands and rose 29 cents to close at $2.74, Jamaican Teas traded 397,510 shares and gained 20 cents to end at $3.70, Jetcon Corporation climbed 35 cents to end at $2.85 while 352,125 units traded. KLE Group traded 1,000,000 shares with a rise of 5 cents to $1.45, Lasco Distributors gained 68 cents and ended at $7.20 with 265,511 trading. 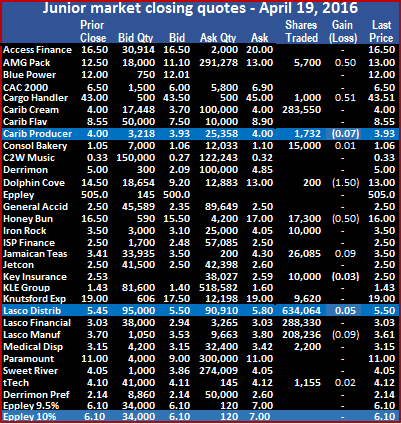 Lasco Financial closed at $3.10 with 1,493,865 shares changing hands but rose 10 cents, Lasco Manufacturing fell by 5 cents to close at $4.70 with 597,108 shares trading, Derrimon Trading preference share ended with 21,500 units changing hands to end with a loss of 2 cents at $2.12 and Eppley 10% reference share traded 799,880 units at $6.10. Trading on the junior market resulted in more stocks declining than rising by a wide margin and ended with the index dropping 37.33 points end at 2,067.53 on Tuesday. A volume of 3,312,315 shares valued at $12,515,372 traded, including two large trades, with Lasco Manufacturing accounting for 1,106,586 shares and Caribbean Producers with 1,063,150 shares. The market closed with 16 active securities, 2 of which advanced and 8 declined while 2 stocks closed with bids higher than the last selling prices and 3 ended with lower offers. At the end of trading in a market, Access Financial Services closed at $16.50 with 5,000 units changing hands, Caribbean Cream traded 109,925 units but lost 17 cents to end at $3.83, Caribbean Flavours lost 5 cents to close at $8.50 while 1,222 shares were traded, Caribbean Producers fell 10 cents to end at $3.90. Consolidated Bakeries fell 10 cents in trading just 122,376 shares to close at $1.20, C2W Music had 29,019 units changing hands at 32 cents, General Accidents closed at $2.65 with 136,177 shares changing hands, Honey Bun rose 50 cents to end at $16 with 8,527 shares trading. Iron Rock Insurance fell 40 cents to $3.10 while trading 118,926 shares, ISP Finance had 19,300 shares changing hands, at $2.45, Jamaican Teas traded 74,583 shares at $3.50, KLE Group traded 331,000 shares at $1.40, Lasco Distributors lost 98 cents and ended at $6.52 with 115,359 units trading. 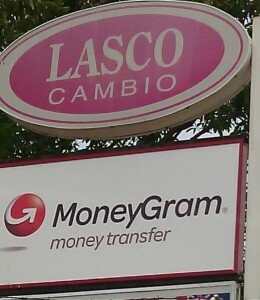 Lasco Financial closed at $3 with 43,200 shares changing hands but with a loss of 3 cents, Lasco Manufacturing gained 20 cents to close at $4.75 and tTech fell 3 cents and ended with 27,965 shares changing hands at $4.15. Trading is off to a fairly slow start on the Jamaica Stock Exchange in the early morning session but with a few reasonable sized trades. Leading off is Lasco Manufacturing with 1,079,447 units followed by Cable & Wireless with 355,488 shares and Caribbean Cream with 97,300 shares while Caribbean Cement chipped in with 63,122 units, Jamaican Teas 74,583 units and JMMB 7.25% traded 200,000 shares. Trading saw all major indices rising moderately, with the main market indices gaining just under 200 points and the junior market index climbing over 10 points after 90 minutes of trading, on Tuesday. The average volume traded amounts to 107,260 units per active stock, compared to an average of 71,293 units traded in the mid-morning session on Monday. A total of only 20 securities accounting for 2,145,196 shares changed hands as 5 stocks gained and 4 declined. The market saw the all Jamaica Composite Index rising 195.09 points to 167,466.80, the JSE Market Index gained 174.44 points to 150,787.09, the JSE combined index ended with a rise of 279.60 points to 161,579.83 and the junior market index rose 11.48 points to 2,116.34. 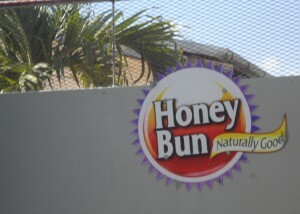 Honey Bun’s board of directors agreed to recommend at an Extraordinary General Meeting to be held in May 2016 a stock split for its shares. Accordingly, it is proposed that each ordinary share of the company be split into five shares. The split will result in the Authorized Share Capital be increased from 97,500,000 shares to 487,500,000 shares of no par value, and the issued and fully paid capital of the company be increased from 94,253,390 shares to 471,266,950 of no par value. Honey Bun reported a strong 175 percent increase in after tax profit to $45.3 million in the first quarter of financial year ending December 2015, from an increase of 42 percent in sales. The company enjoyed an increase in its gross profit margin of 47 percent compared to 45.4 percent in the 2014 quarter. Administrative, Selling & Distribution cost rose much slower than revenues at 21.5 percent over 2014. Earnings per share came out at 48 cents. Honey Bun earned 72 cents per share for the fiscal year to September 2015. 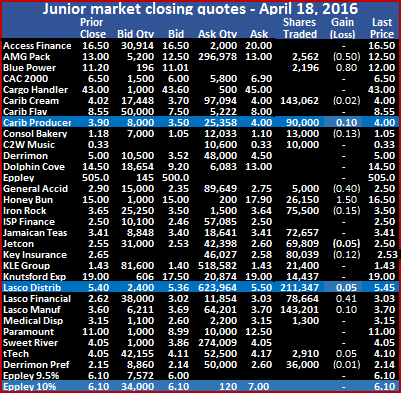 The stock last traded at on the junior market of the Jamaica Stock Exchange at $13. If approved, Honey Bun will be the sixth junior market listed company to split their stock. Others that had a split are Access Finance and the three Lasco companies into 10 shares, and recently, Jamaican Teas into two shares for each one held. Honey Bun fell $3 to close at $13 on Wednesday. 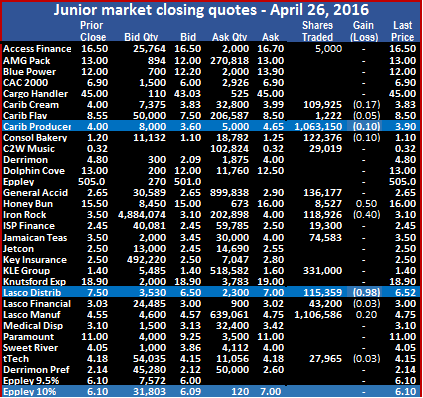 The junior market index recovered some ground on Wednesday with a gain of 26.10 points to end at 1,881.43. Trading ended with 12 active securities, 6 of which advanced and 5 declined while 1,448,567 units valued at $4,853,764, changed hands. At the close of trading only 3 stocks closed with bids higher than the last selling prices and just 2 ended with lower offers. At the end of trading, AMG Packaging closed trading with 8,000 units to end at $13, Cargo Handlers hit a new 52 weeks’ high by gaining 52 cents to close with 1,000 units changing hands at $43.51, Caribbean Cream traded 38,648 units to end at $4 after trading down to $3.65 in the morning session. 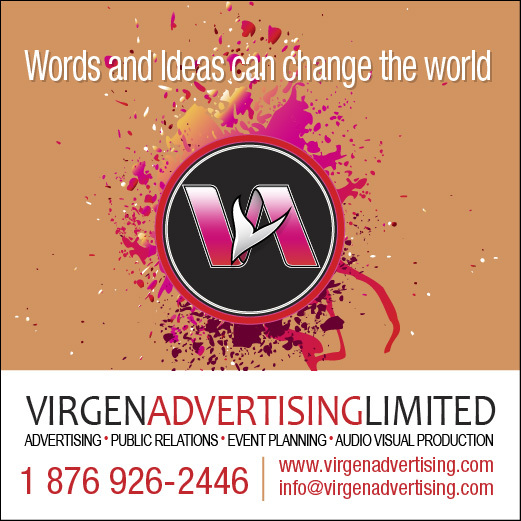 Caribbean Producers traded 4,570 units but gained 7 cents to end at $4, Consolidated Bakeries gained 4 cents with 1,000 shares trading $1.10, General Accident traded 939,649 shares and rose 15 cents to end at $2.65, Honey Bun fell $3 to close at $13 while 5,898 shares changed hands. Iron Rock Insurance did not trade but had 5,003,000 units on the bid to at $3.10, while the stock last traded at $3.50. Jetcon Corporation fell 3 cents and closed at $2.47 after 61,500 shares changed hands, Lasco Distributors gained 30 cents to end at $5.80 with 216,200 units trading, Lasco Financial fell by 8 cents and closed at $2.95, with 4,000 shares changing hands. Lasco Manufacturing gained 11 cents with 151,325 shares changing hands to close at $3.72 and tTech ended with 5,744 shares changing hands at $4.15 as the price gained 3 cents. The junior market index lost some ground by the close on Tuesday with a loss of 19.39 points to end at 1,855.33, but trading volumes climbed above Monday’ s levels as Caribbean Cream, Lasco Distributors and Lasco Financial Services traded over 280,000 units each. Trading ended with 16 active securities, 6 of which advanced and 5 declined while 1,514,172 units valued at $7,024,157, changed hands. On Monday 1,099,234 shares traded valued at $4.6 million at the close of trading only 1 stock closed with the bid higher than the last selling price and just 2 ended with lower offers. At the end of trading, AMG Packaging gained 50 cents in trading 5,700 units to end at $13, Cargo Handlers hit a new 52 weeks’ high by gaining 52 cents to close with 1,000 units changing hands at $43.51, Caribbean Cream traded 283,550 units to end at $4. Caribbean Producers traded 1,732 units but fell 7 cents to end at $3.93, Consolidated Bakeries gained 1 cent with 15,000 shares trading $1.06, Dolphin Cove traded 200 shares at $13 for a loss of $1.50, Honey Bun fell 50 cents to close at $16 while 17,300 shares changed hands. Iron Rock Insurance closed with 10,000 units changing hands to end at $3.50. Jamaican Teas rose 9 cents and closed at $3.50 after 26,085 shares changed hands, Key Insurance fell 3 cents while trading 10,000 shares to close at $2.50, Knutsford Express closed with 9,200 units changing hands at $19. 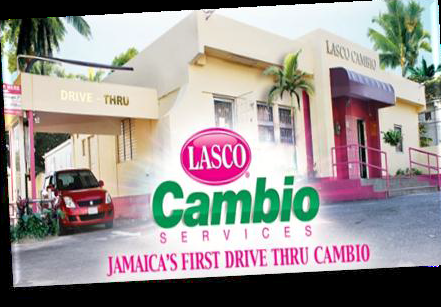 Lasco Distributors gained 5 cents to end at $5.50 with 634,064 units trading, Lasco Financial rose by 41 cents and closed at $3.03, with 288,330 shares changing hands, Lasco Manufacturing gained 10 cents with 208,236 shares changing hands to close at $3.70. Medical Disposables closed at $3.15 with 2,200 shares trading and tTech ended with 1,155 shares changing hands at $4.12 as the price gained 2 cents. The junior market closed slightly higher on Monday with a gain of 21.36 points to 1,874.72, helping in the rise was another climb by Honey Bun following the announcement of a consideration for a stock split. Trading ended with 20 active securities, 7 of which advanced and 8 declined while only 430,780 units valued at $4,634,021, changed hands. There were only 3 stocks closing with bids that were higher than their last selling prices and 3 ended with lower offers. At the end of trading, AMG Packaging lost 50 cents in trading 2,562 units to end at $12.50, Blue Power gained 80 cents to close with 2,196 units changing hands at $12, Caribbean Cream traded 143,062 units to end at $4 after falling by 2 cents, Caribbean Producers traded 90,000 units and gained 10 cents to end at $4. Consolidated Bakeries fell 13 cents with 13,000 shares trading $1.05, C2W Music closed at 33 cents with 10,000 units changing hands, General Accident Insurance traded 5,000 units but fell by 40 cents at $2.50, Honey Bun jumped $1.50 to close at $16.50 while 25,160 shares changed hands. iron-rock-ipo-hits-market-shortly/”>Iron Rock Insurance fell 15 cents with 75,500 units changing hands to end at $3.50, Jamaican Teas closed at $3.41 after 72,657 shares changed hands. Jetcon Corporation ended trading with 69,809 shares at $2.50 having lost 5 cents, Key Insurance fell 12 cents while trading 80,039 shares to close at $2.53, KLE group traded 21,400 units at $1.43, Knutsford Express closed with 14,437 units changing hands at $19. 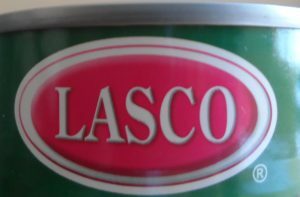 Lasco Distributors gained 5 cents to end at $5.45 with 211,347 units trading, Lasco Financial rose by 41 cents and closed at $3.03, with 78,664 shares changing hands, Lasco Manufacturing gained 10 cents with 143,201 shares changing hands to close at $3.70. Medical Disposables closed at $3.15 with 1,300 shares trading, tTech ended with 2,910 shares changing hands at $4.10 as the price gained 5 cents and Derrimon Trading preference share ended with 36,000 units changing hands as the price slipped by 1 cent to end at $2.14.